Michael was a healthy, happy young boy with dark red hair and deep brown eyes. He was bright, beautiful, energetic and smart. He loved soccer, loved riding his bike, loved playing with his brother and playing with his family. Everyone absolutely adored him. 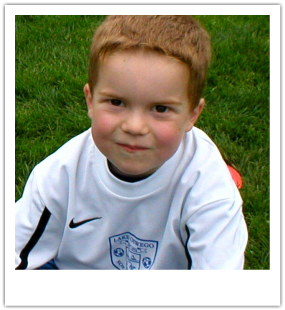 Sadly, Michael passed away unexpectedly while playing soccer at the age of 5. His family and friends wanted to find a way to honor Michael by providing smiles and comfort to kids in the hospital. Our local children's hospitals (The Randall Children's Hospital at Legacy Emanuel and Doernbecher Children's Hospital) have a unique program that provides every child admitted (from broken arms to major surgery to life threatening illnesses) with a soft stuffed animal to comfort them. Because of this program, the hospitals are always in need of stuffed animals. The Michael Grimm Foundation has collected and donated stuffed animals every year since 2003. Each year, the delivery is made around December 6th, Michael’s birthday. The hospitals always run low on stuffed animals (and some years they are completely out) and are always anticipating our delivery! The Michael Grimm Foundation also supports facilities, organizations, clinics, schools, and individuals based on what MICHAEL would want. We want to help keep his memory alive and well by giving to deserving children to help them be healthy, learn, be comforted, or maybe even make a dream come true. Many children have benefited from those who have generously donated to the Foundation to help other kids.